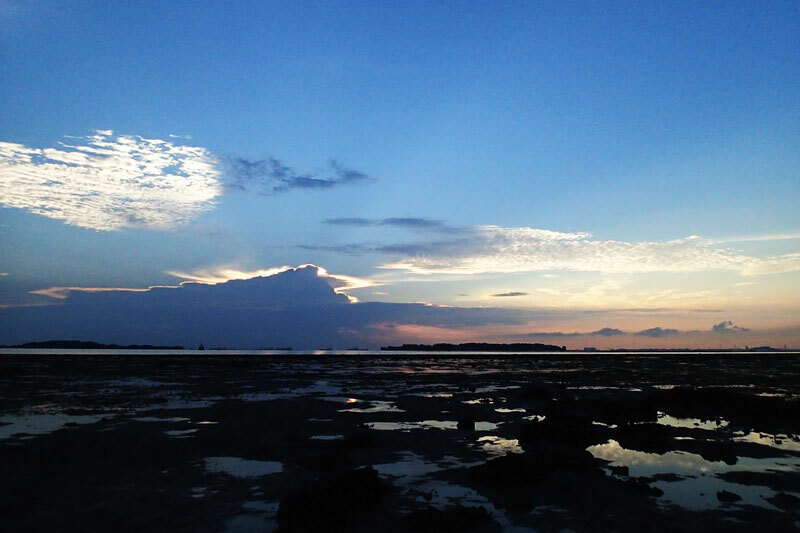 It was a rather hot day today as we journey to Pulau Semakau for another intertidal survey session. The team had visited this part of the shore a few months ago on National Day. 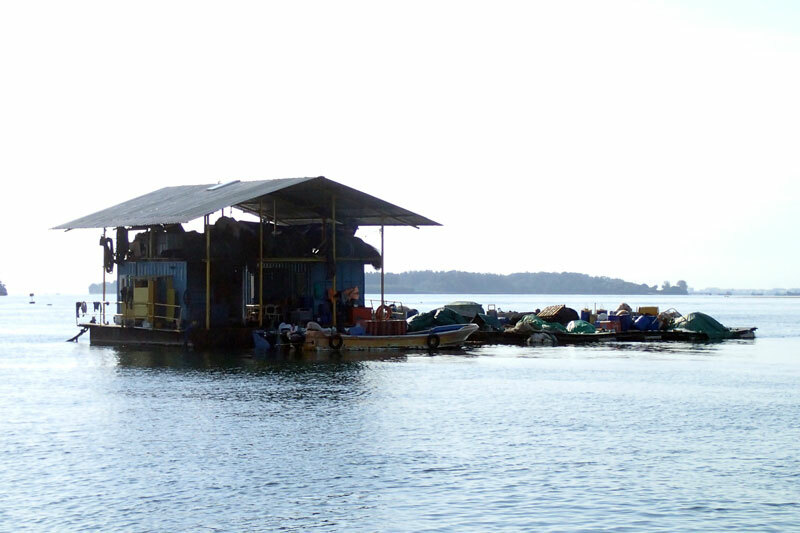 We passed by quite close to the fish farm next to Semakau. There is a barge right next to the fish farm loaded with stacks of bags which may be fish food. On the barge (right side on the photo), there seems to be a large rectangular metal container used for incinerating things. I could see smoke coming out of the rectangular container and smelled something being burnt. 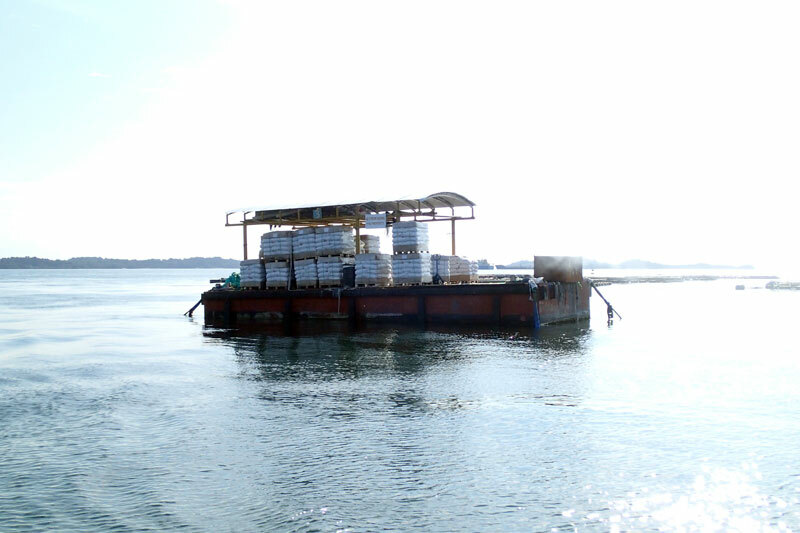 Anchored barge with stacks of white sacks. 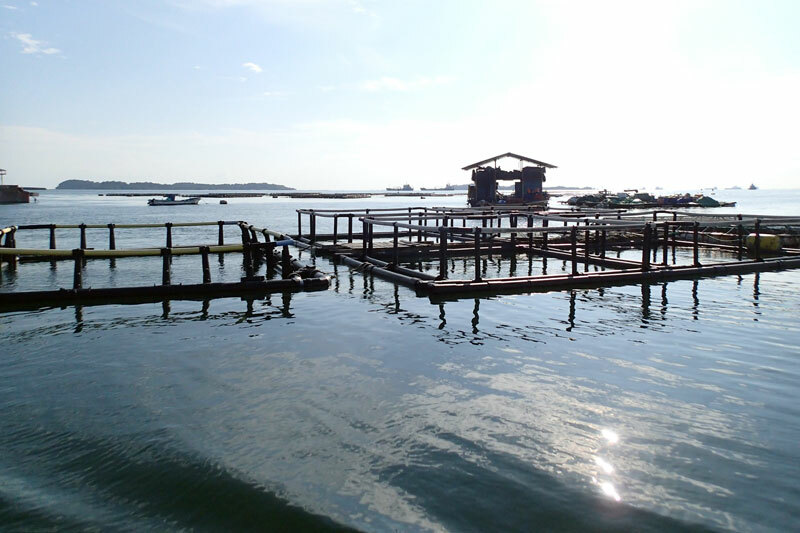 The structure of the fish enclosures in this fish farm is very different looking than the northern fish farms. 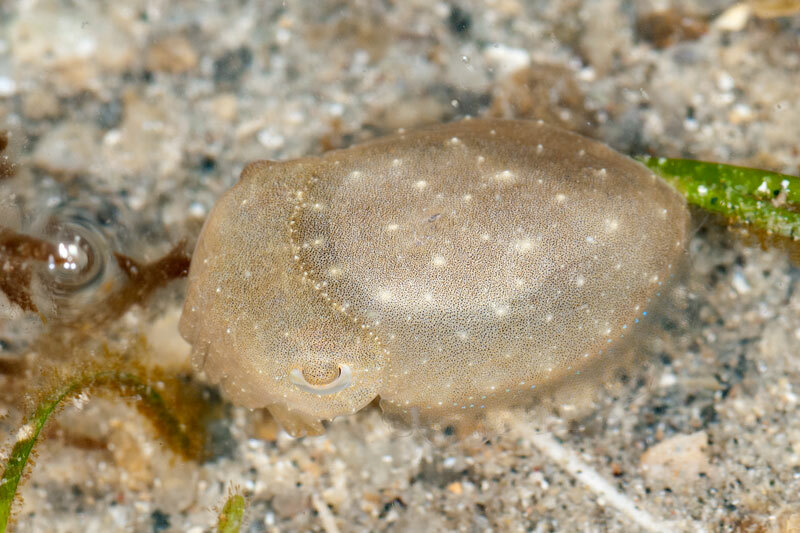 Upon landing on the shore, Ivan spotted a cuttlefish about the size of my palm. 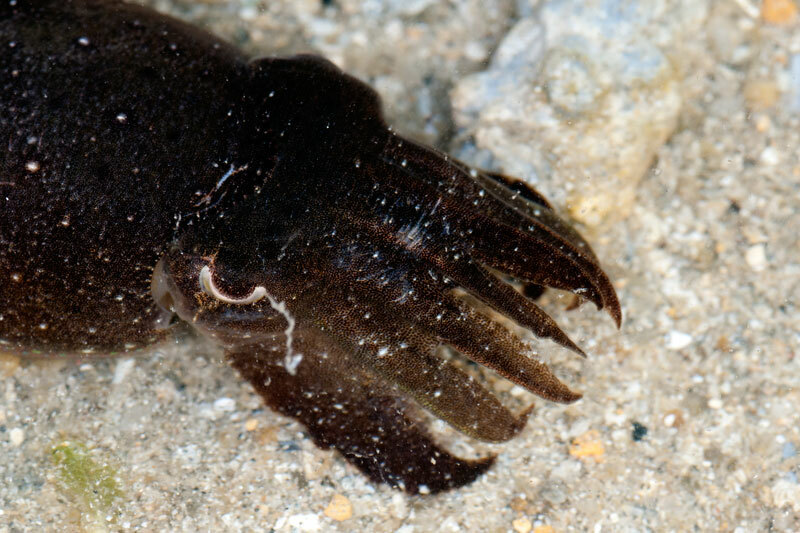 It was not easy to get the cuttlefish to show its tentacles. 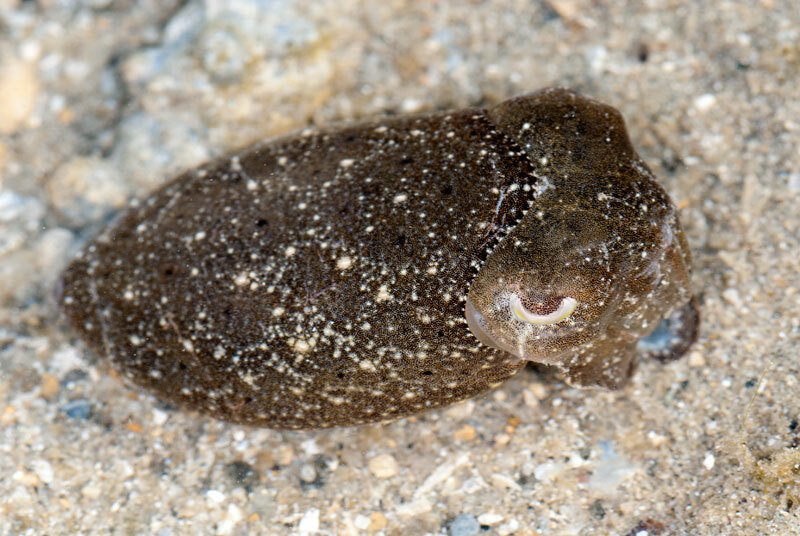 Side view of the cuttlefish. 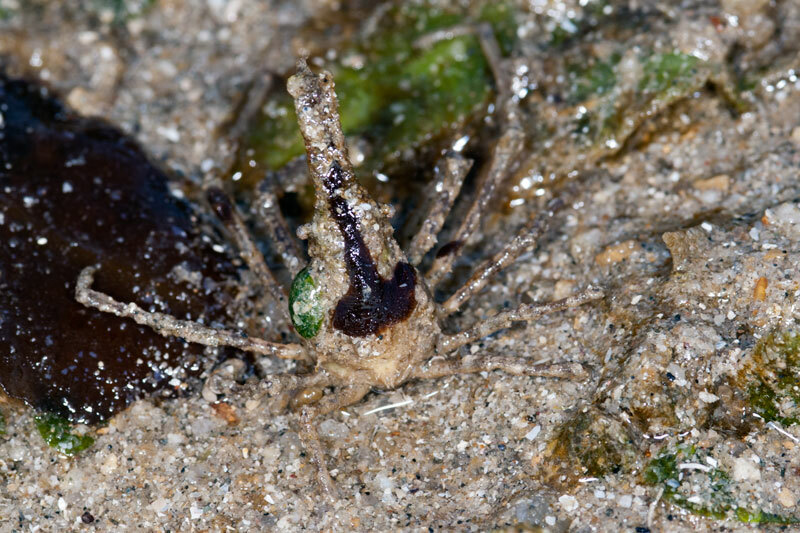 Chay Hoon spotted a small cuttlefish among the seagrass blades. 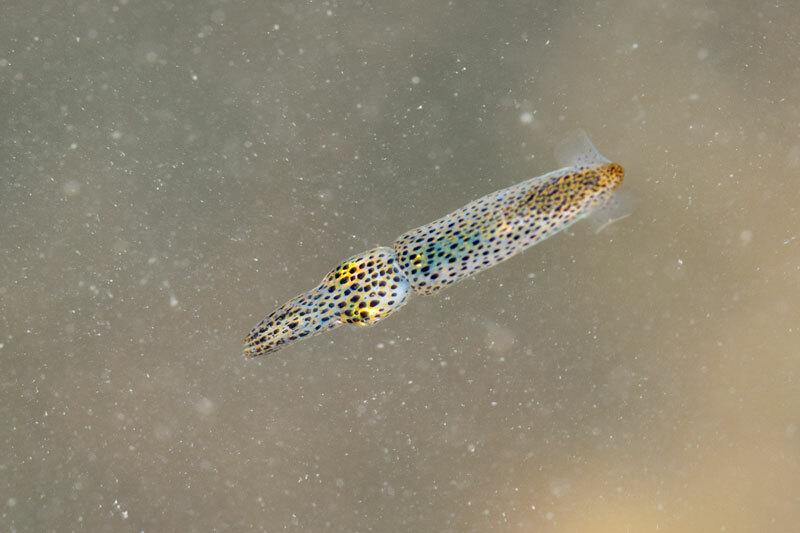 The seagrass meadows provides small shelter space for growing animals. 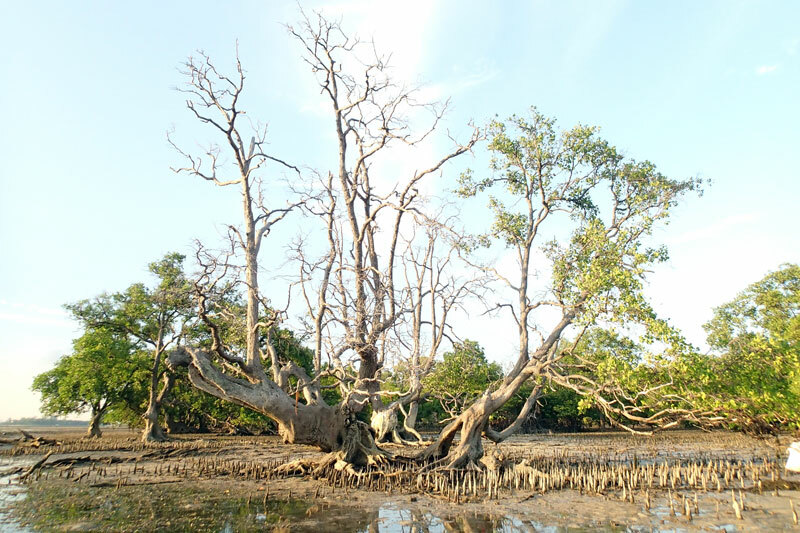 As the team made their way to different parts of the shore to check, I headed towards the river mouth to explore. 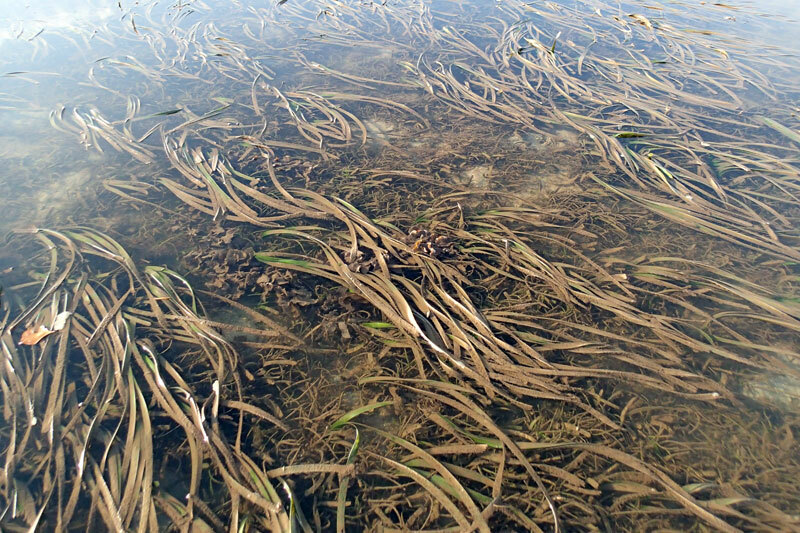 Along the way, there were patches of very long tape seagrass (Enhalus acoroides). 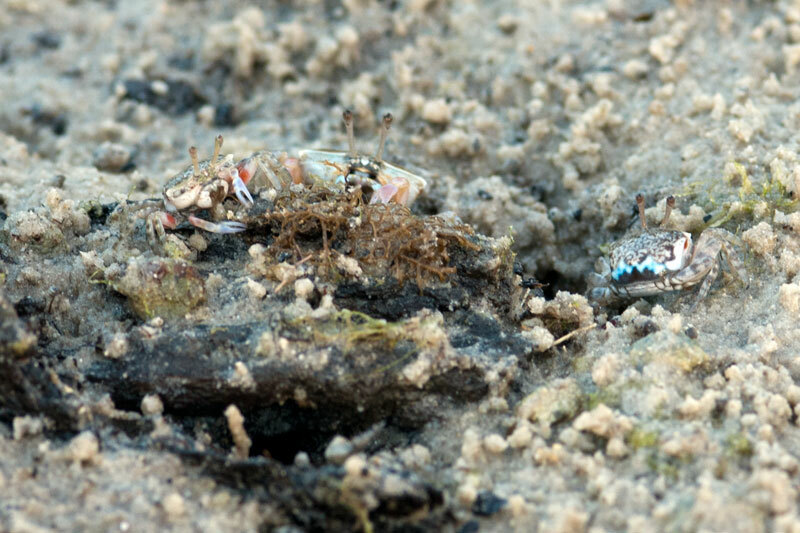 I used 'very' because most of the tape seagrass we monitor and usually see are rather short and burnt at the ends. What's more exciting about these tape seagrass is that some of them releasing male flowers! 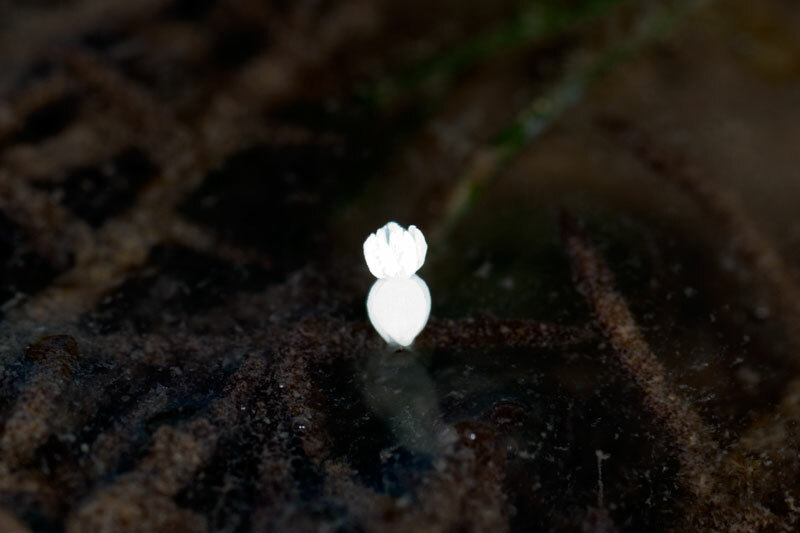 It is so tricky to photograph the male flowers as they are small and white like tiny styrofoam bits. The camera tend to over expose the flower. One male flower of tape seagrass. There are no magical powers involved to make these male flowers stand. One end of the male flowers of the tape seagrass is hydrophobic (repels water), which allows the flower to 'stand' upright on water surface or even wet fingers. More flowers on tape seagrass blade. I think the male flowers looked like tiny standing teeth. 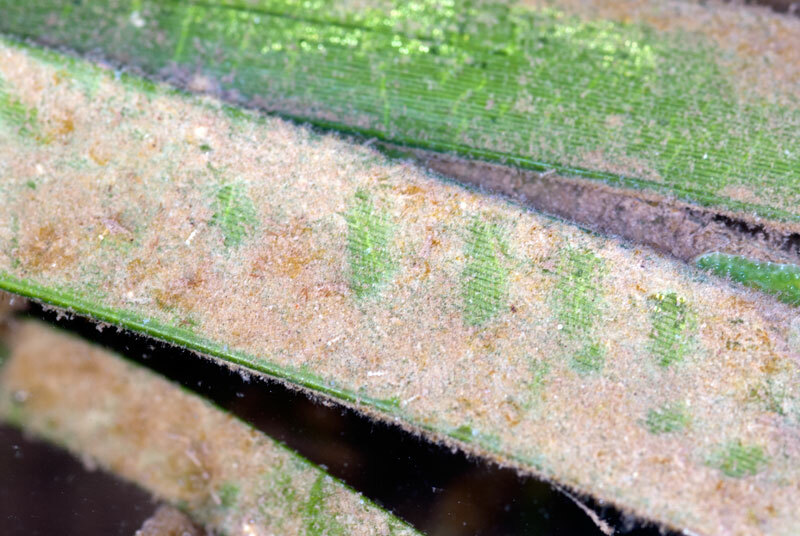 I have also started noticing bare spots on the epiphyte (small plant which grows attached to another plant) covering the seagrass blades. 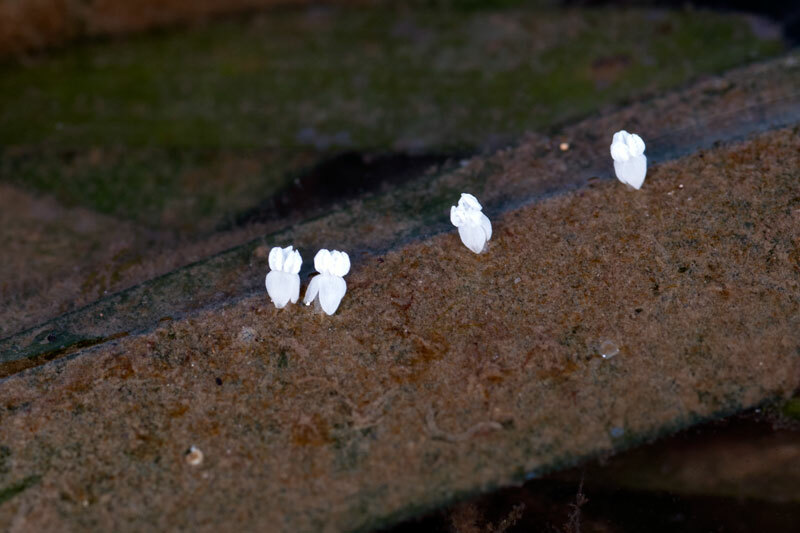 Animals feeding on the epiphytes? 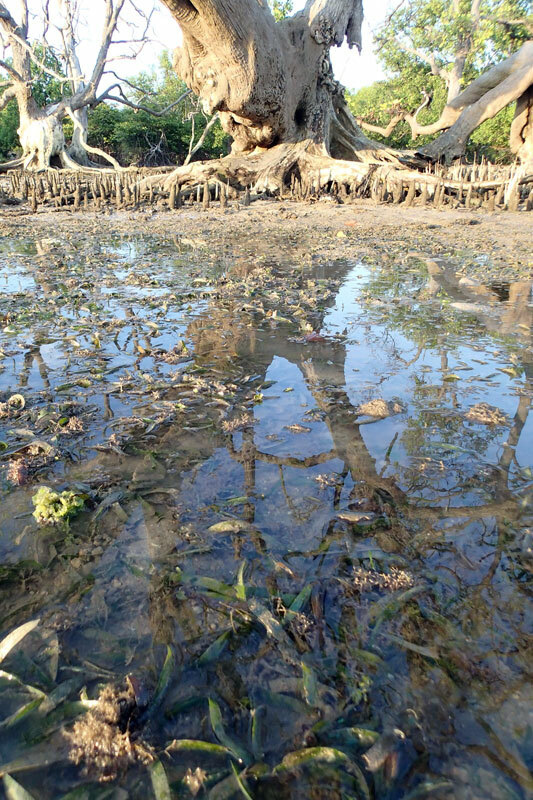 As I head nearer to the river mouth the habitat changed from a sandy, seagrass meadow to a slightly muddy substrate with breathing roots sticking out. 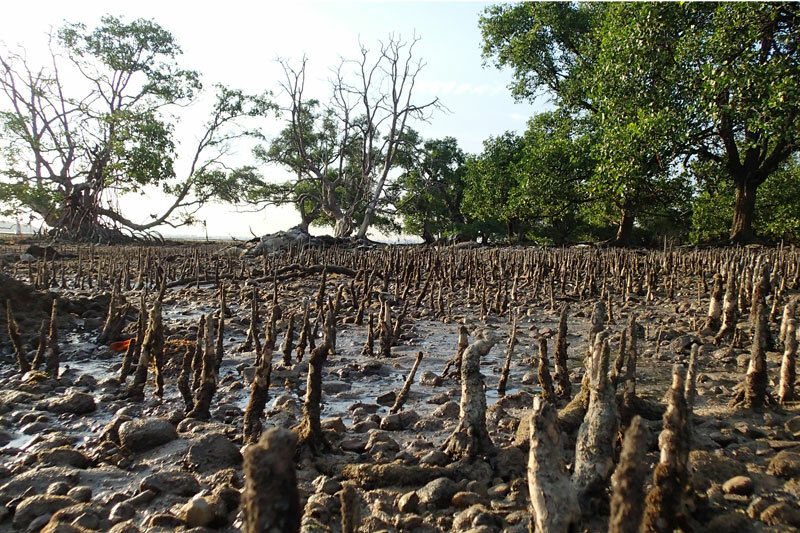 I am approaching the mangrove area. 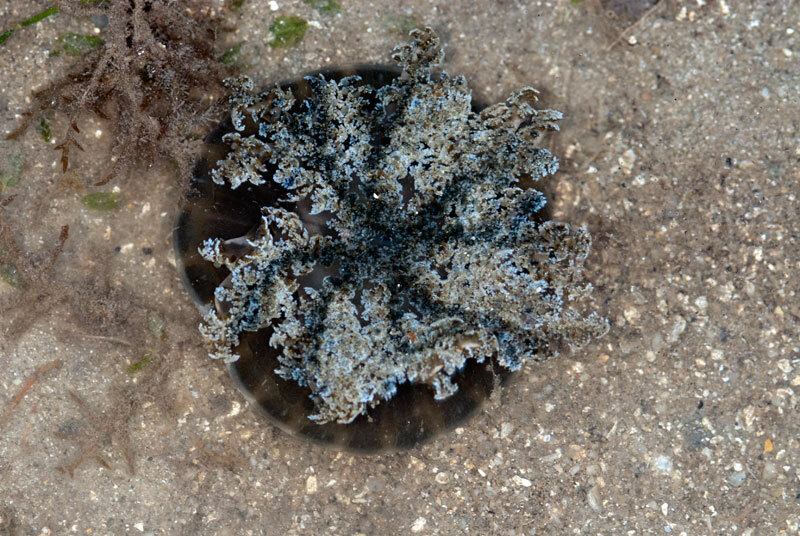 By the banks at the river mouth, it is stunning to see marine animals settling comfortably. 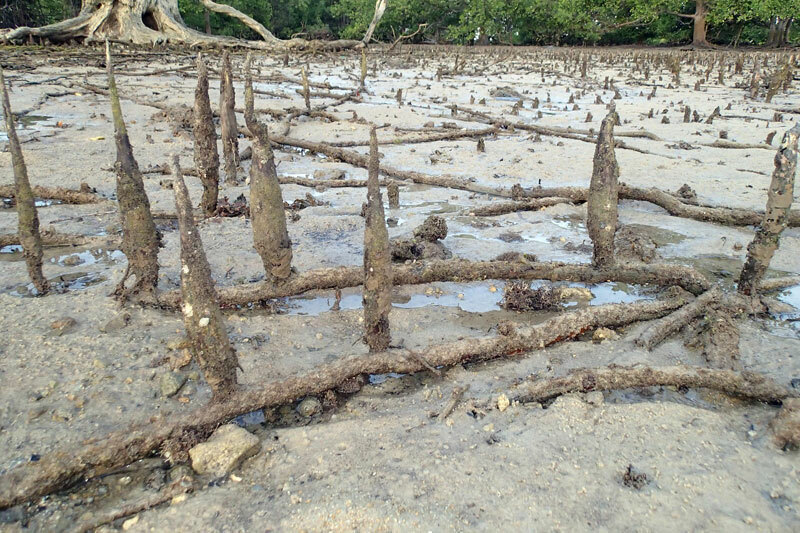 There were clumps of tape seagrass on the river bed. 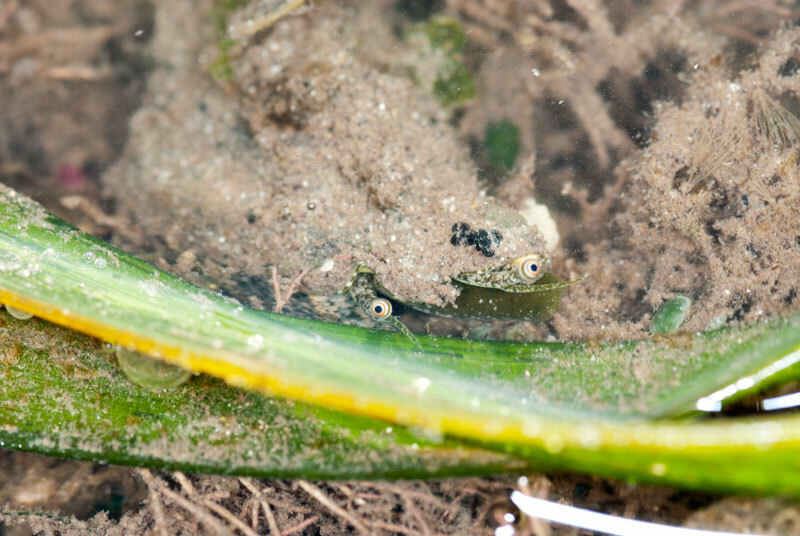 As I was bending to take a closer look at the marine life on along the bank, a pair of eyes looked back at me. "What interesting eyes you have." It was the Pearl conch (Strombus turturella) looking at me. 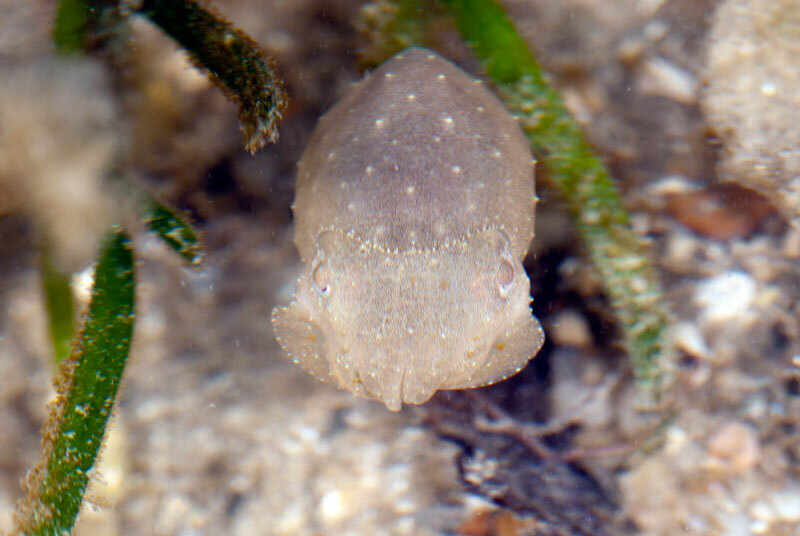 On the water surface there were a few pygmy squids (Idiosepius sp.) 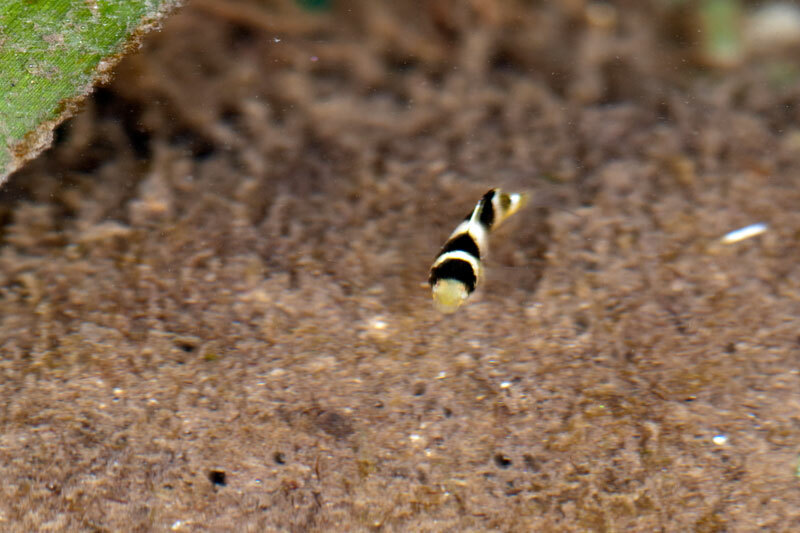 swimming around. 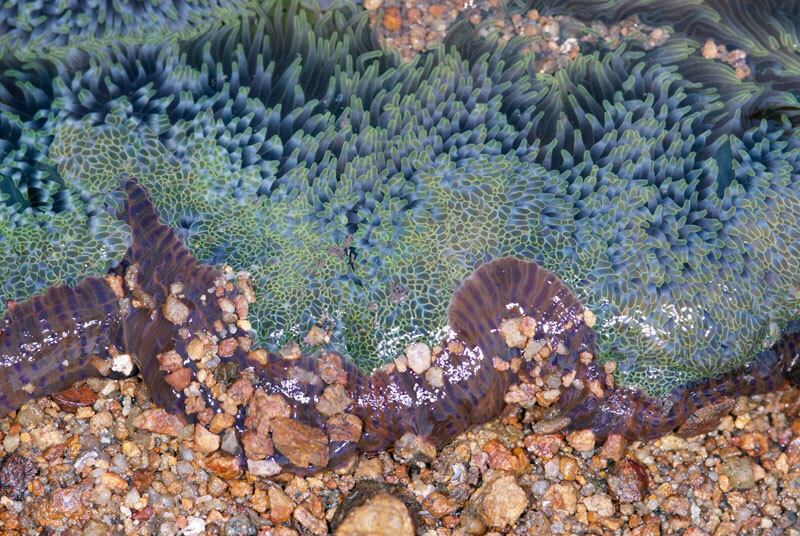 There were also some individual giant carpet anemones (Stichodactyla gigantea) along the bank and they can be found next to the rock wall slope on the bank. And some yellow-banded damselfish (Dischistodus fasciatus). 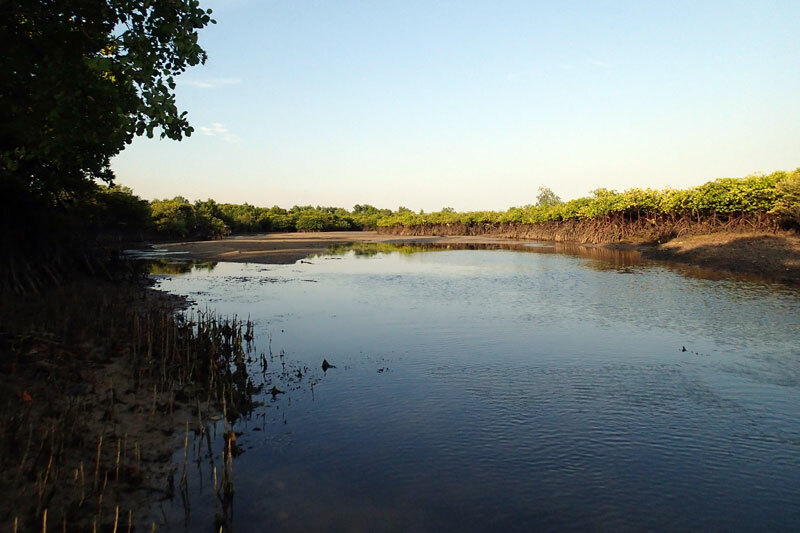 As I walked further up the river, the tranquility of the mangrove slowly reveals itself to me. 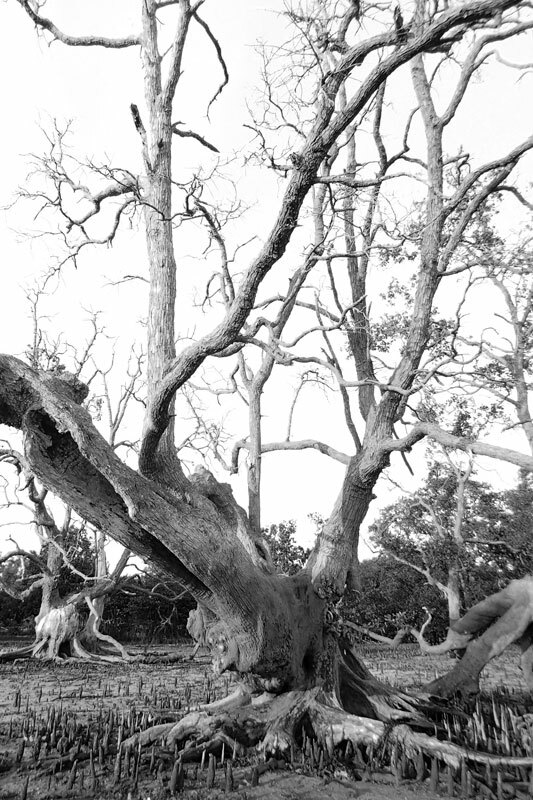 Where the river flowed from. 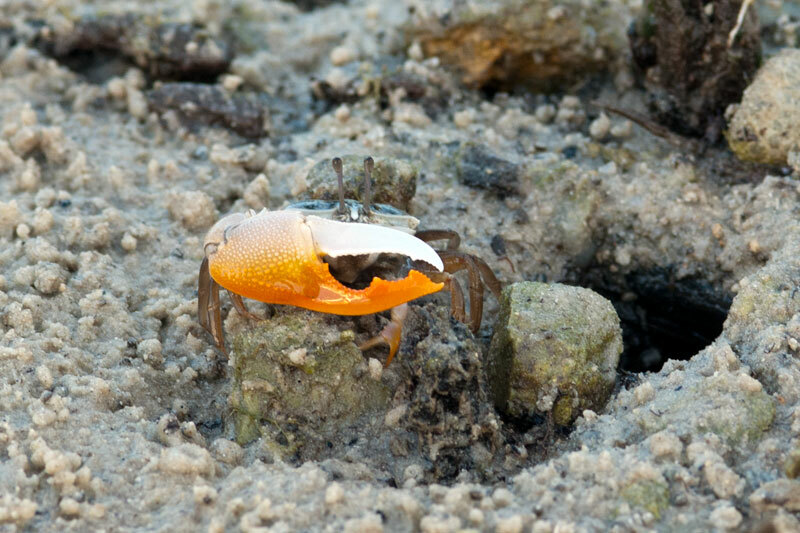 On the rather firm mangrove ground surrounded by some Sonneratia and Rhizophora trees, the orange fiddler crabs (Uca vocans) are out busy feeding. They are very sensitive animals and requires patience to photograph during daytime. 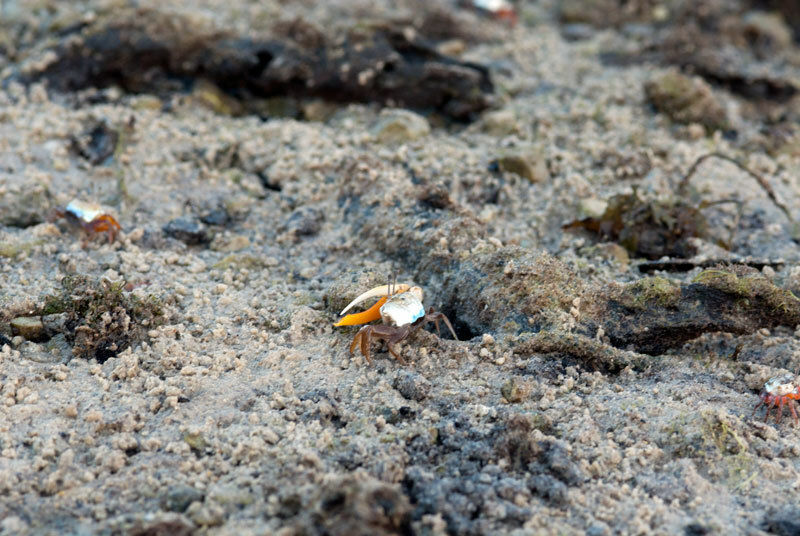 How many fiddler crabs can you see here? 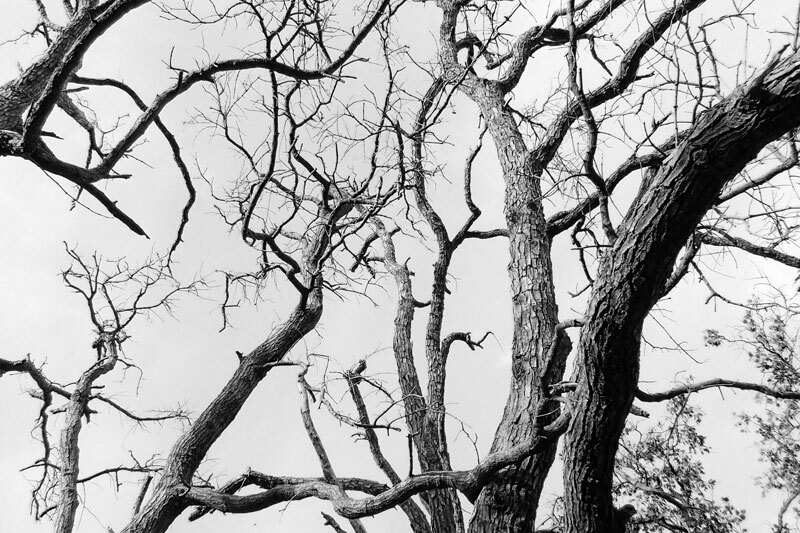 The dead mangrove tree provided a lot of details for artistic shots. The roots system of the Sonneratia tree is not as simple as you think. 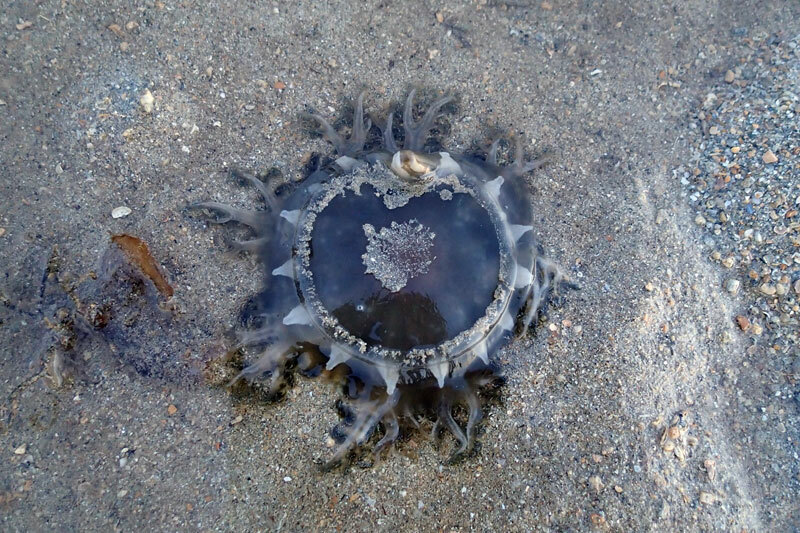 Back to the sandy shore, I came across two upsidedown jellyfish (Cassiopea sp.). One was "upsidedown". As the sun begins to set, it was time to leave the shore. This probably marks our last trip for the year till about next March as the tides are not low enough for us to visit our shores. James with photos on his Facebook. Teacher. Drone Commander. Diver. Photographer. 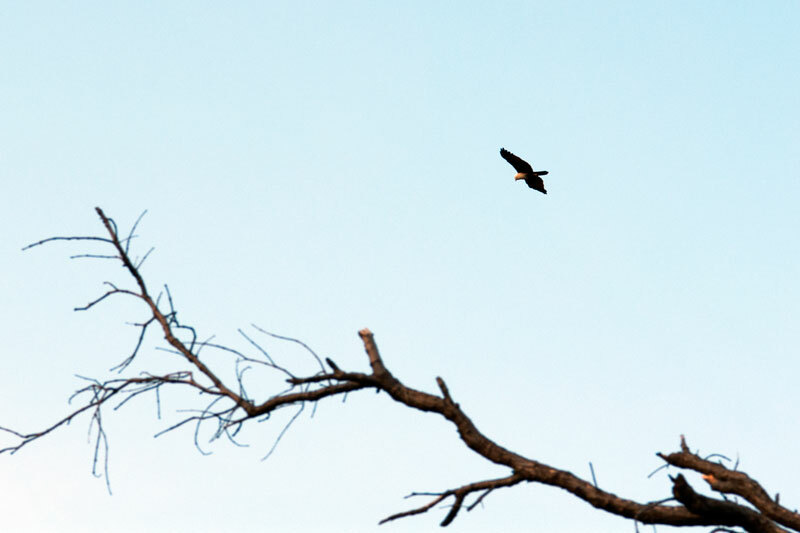 Theme images by TommyIX. Powered by Blogger.